As well as the rebirthed XR-311, AM General submitted another design to try and win the lucrative XM966 contract for the High Mobility Multi-Purpose Vehicle TACOM (Tank Automotive Command) had demanded in 1977. While the XR-311 was an ‘outside’ design they received via Food Machinery and Chemical Corporation (FMC) in 1975, the new High Mobility Multipurpose Wheeled Vehicle (HMMWV) XM966 would be a different vehicle to meet the same requirement. Work on this new vehicle began in 1979 with the amended HMMWV requirement. First pattern of prototype AM General HMMWV during testing. The fact that it evolved from the XR-311 is obvious. AM General was already manufacturing the M151 Mutt under contract and owned the Jeep brand name so could be seen as the inheritors of its pedigree. 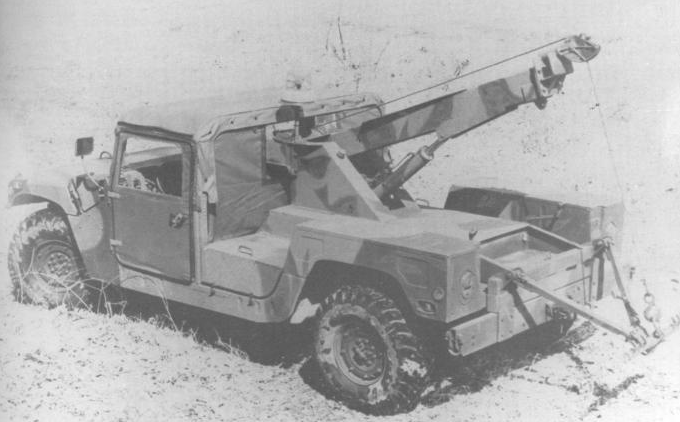 AM General also produced a 5.25 ton chassis for a conventional truck which was in service as the M715 with a ‘double-drop’ down ladder frame. The vehicle produced from this frame had a wheelbase of 3.2 meters (M715) or 3.35 meters (AM715). 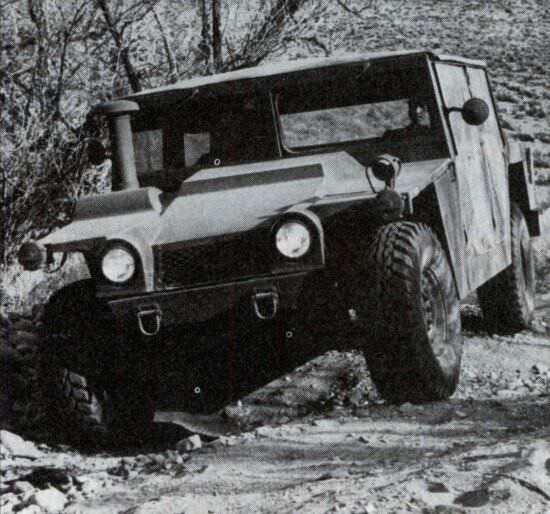 Prototype of the AM General HMMWV during testing. 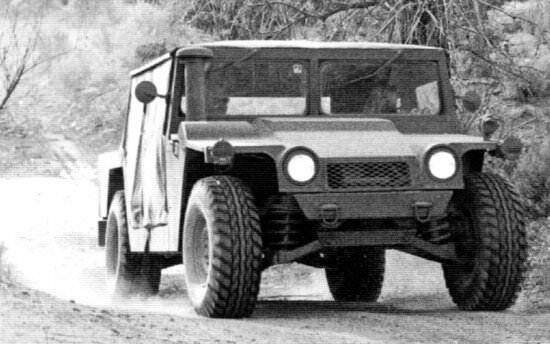 AM General built an initial prototype configured as a weapons carrier based on the modified ladder chassis of the ‘Senior Jeep’ (SJ, a civilian model) and M715. The frame was not like the XR-311 at all, the tubes being replaced with rails like on the SJ. However, this version featured 8 supporting cross braces for additional strength and rigidity instead of the 6 of the SJ. The chassis was steel but the bodywork would be aluminum. The engine originally selected was that of the reworked XR-311, an air-cooled 6.6 liter Deutz diesel coupled to a three-speed Chrysler transmission but this was changed to a 130 bhp 6.1 liter General Motors V8 diesel engine coupled to a General Motors THM400HD Hydramatic three-speed automatic transmission which was already in use by the Army in their M1008 Commercial Utility Cargo Vehicle (CUCV). That GM DDA V8 130 bhp engine was later changed once more to a 6.2 liter General Motors V8 diesel producing 150 bhp instead. Second pattern prototype AM General HMMWV during testing configured as an ambulance. 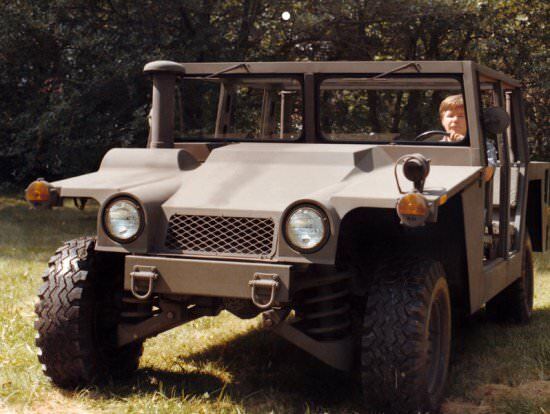 The front is now nothing like the XR-311 and much more HMMWV like. AM General did a significant amount of testing of their own vehicle and, by February 1980, their HMMWV had covered over 17,000 miles (27,400 km). They then made 5 more vehicles which were sent to the Nevada Auto Test Center (NATC) for a 50,000 mile (80,500 km) pre-test. This was to simulate the sort of tests the Army would put the design to. This was well planned considering a year later the Army submitted final specifications it would need to meet. The CVSP had initiated the process and the HMMWV program had continued it and, in February 1981, the Army finalized what they wanted from this new vehicle inviting designs from 61 manufacturers. AM General was ideally placed to submit their own design therefore and submitted their proposal for US$4 million for the 11 prototypes required by the Army which would have to be delivered prior to May 1982. AM General made 12 more prototypes which started testing under Phase 1 Durability and Operational Testing (DT/OT) in July 1982 in Yuma, Arizona (extreme heat) and Aberdeen Proving Grounds (APG), Maryland (temperate climate tests). During testing though, despite having had their vehicle evaluated in Nevada beforehand, there were serious problems with the brakes on this new vehicle and modifications had to be conducted in order to be permitted to take part in Phase II trials at Fort Hunter-Leggett in California which started on the 1st of November 1982. Phase II trials would also use soldiers as the crew which could be anticipated to mean somewhat more rigorous testing. Phase III testing involved handling features including deep wading and it was after this that the AM General design had come out of top. Not problem free but rugged, durable, and mobile. In total, about 600,000 miles of testing was carried out on the vehicles including trials at APG, Camp Pendleton (USMC), and in Coronado (USN). Although it wasn’t a problem, the horizontal grille on the front was changed to a vertical grille presumably to try and look more ‘Jeep-like’. 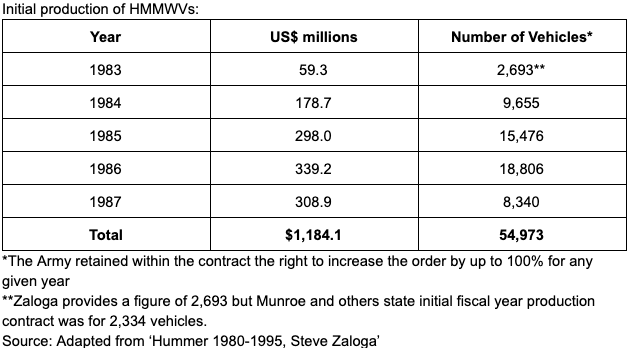 It had taken years but finally, the US Army had its ‘HMMWV’ design chosen and the contract awarded on the 22nd March 1982 (GAO report states March 1983) was the design from AM General for production over the next 5 years for over nearly 55,000 vehicles. There were serious reliability problems revealed during the testing which the Department of Defense glossed over. The AM General HMMWV had only managed 82 mean miles between unscheduled maintenance instead of the 320 miles required and only 367 mean miles between mission failure defects (those rendering the vehicle incapable of use without repair) as opposed to the 1,300 miles required. These faults created a 26% deficiency from performance to what was wanted. “… the Army’s decision to award a full-scale production contract was premature in view of reliability problems disclosed in the operational tests and that additional operational testing should have been performed before large sums of production dollars were committed… the HMMWV fell short by a wide margin of achieving reliability requirements due to many hardware malfunctions”. The first production vehicle rolled off the production line on January 2nd, 1985. Over the next 4-5 years, a total of 55,000 vehicles (see chart) were produced for the US military of which 39,000 were for the Army alone. Further numbers were also produced for foreign countries such that, after 10 years of production, over 100,000 HMMWVs had been built. 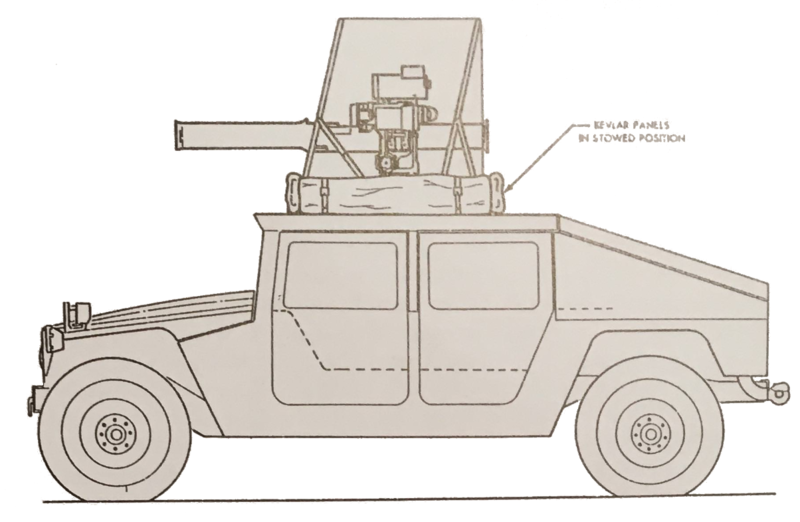 This vehicle would have the ballistic protection required and a hatch in the roof with a weapons mount for a variety of weapons such as the 40mm automatic grenade launcher, a variety of machine guns, possibly a recoilless rifle, and the TOW ATGM system. 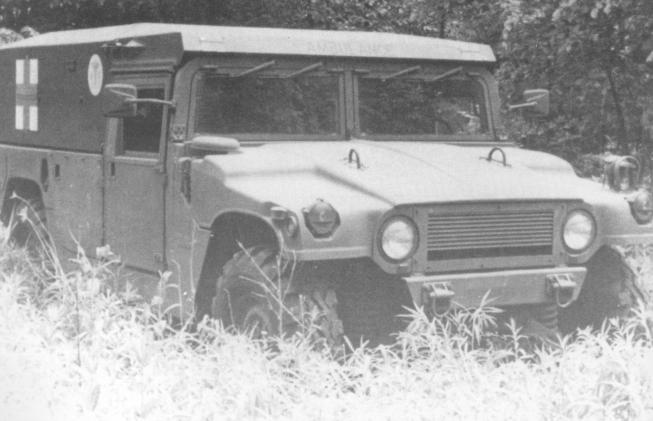 A majority of vehicles for the Army were to be in this configuration. Unarmoured and using only canvas, plastic, and rubber, doors and roof to keep the crew protected from the weather. This configuration would be the base vehicle for a variety of sub-variants for fulfilling minor roles or for carrying other box-bodies on the back. Only a photograph is known of this variant which appears to be unarmoured and mounts a small winch and jib on the back. It would have been ideal as a light recovery vehicle for towing broken down HMMWVs etc. but not much else. Only one prototype is known. 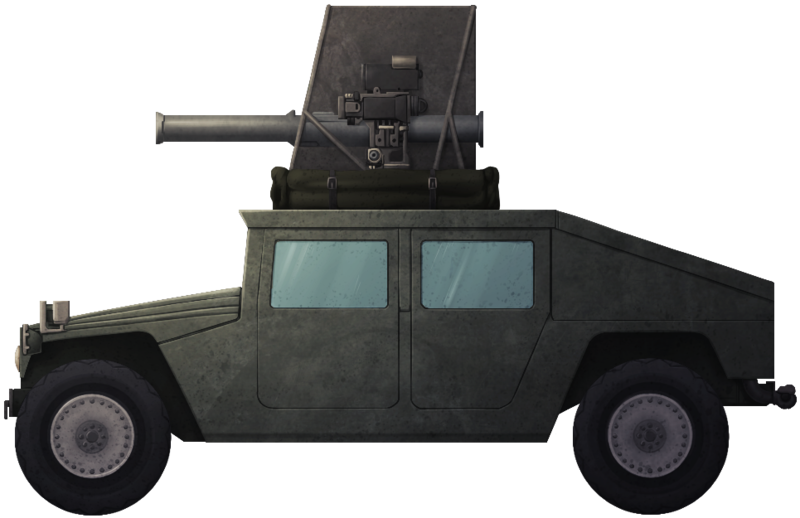 The HMMWV had been chosen and changes had been incorporated from the prototype to the first generation of production. The first HMMWV ‘Hummer’ rolled off the production line in Mishawaka, Indiana on the 2nd January 1985 and further contracts for production were to follow. The HMMWV was born and it would find use across the world in conflicts and peacetime with numerous nations. Considering how you’ve been doing a lot of articles on Humvee prototypes lately, are you thinking about doing an article on the actual production model itself? It’s currently in writing since three years. It will be published this year hopefully.